Steven Spielberg, Peter Jackson, Edgar Wright, Joe Cornish and Steven Moffat collaborate as director, producer and writers respectively to give us a three dimensional, motion capture action-adventure…it is a prospect that had the pulse of film fans across the world racing, unfortunately however the film itself cannot achieve such a feat. While a Steven Spielberg film is always something to be anticipated, it was the writers who pushed my anticipation up a gear. Edgar Wright is one of the reasons why I am the film fan I am today, Moffat is currently steering the ship on one of my favourite TV shows of all time (Doctor Who) and Joe Cornish gave us this year’s Attack the Block. Considering the talent at the typewriter it is a shock that Tintin’s greatest weaknesses come from the storytelling department. While the film visually evokes Indiana Jones it lacks what made those films truly special and enjoy such longevity. The MacGuffin of this film, unlike the ones in the Indiana Jones series (Felt wrong typing that instead of trilogy) is incredibly weak and uninspired when it is finally revealed. The film never really seems to have much of a story and consists mainly of a series of action sequences stringed together by a supposed mystery, which never fully catches your attention. At no point did I feel like I was on the adventure with these characters. What they are chasing is kept a mystery for the large majority of the narrative. This is fine to do if the film is therefore played as a mystery, however when you play the film as a clue to clue action-adventure, it is hard to become invested in anything that is happening on screen when you have no idea what is at stake. The film’s plot is incredibly inconsequential and unlike films of a similar ilk, when faced with the situation that the competition may seize the MacGuffin, my thought process was not “Oh no!” but “So what” This lack of investment can also be applied to the film’s main character…Tintin. While Tintin by design may be an ambiguous character he lacks the charm, wit or relatability of other Spielberg protagonists. He seems like a cog in a wheel rather than a character, his only purpose in the narrative seems to be to propel the story along rather than to provide it with any emotion or intrigue. It is impossible to detect what his motivations are and I never found myself rooting for him at any point in the film. Going back to the story while I have never read a single Tintin book (Something which I do not believe discredits my opinion on this film) I have read that they contained satire about history and politics. This satire is missing completely from this film and could have been appreciated. A lot of the humour in Tintin is very broad and slapstick, which will only appeal to a younger demographic. A bit of the original source material’s satire could have provided the film with a much-needed extra dimension of humour and depth. Steven Spielberg is a director who is commonly associated with pushing boundaries and raising the bar technologically. With films like Jurassic Park, E.T., Minority Report and Saving Private Ryan, Spielberg furthered the portrayal of their respective universes or objects/creatures of interest. It is a surprise then that Spielberg brings nothing new or revolutionary to the table when it comes to the motion capture or the 3D. While the motion capture is unbelievable to look at, the emotion doesn’t shine through the way it did in Rise of the Planet of the Apes. While that could be traced back to performances and material, it doesn’t feel at any point like Tintin is showing us something extraordinary that we have never seen on screen before. The film’s 3D is also absolutely pointless. The extra dimension adds nothing and it is a shame to see Spielberg give such a pedestrian take on the technology. The film will be brighter, clearer and as a result more technically impressive in 2D (See this in 2D and let us bring an end to this 3D fad, Hollywood executives won’t stop it but we can make them) the 3D technology has reached a point where we are dithering with it, either go the Piranha 3D route and be shameless and gimmicky with it or don’t use it at all. You want depth and immersion? See something in IMAX. The film is not all bad however. Spielberg certainly knows how to pull off an action sequence and there are two or three scenes in this film, which provide the sense of adventure I was expecting. A plane crash sequence is one of the moments in the film, which is not just reminiscent of Indiana Jones but successfully replicates it. A chase sequence through the streets is also thrilling and has that wonderful domino effect, while the integration of Captain Haddock telling a story with footage of the event itself being a master class of editing. John Williams gives a score that lacks a real stunning track and the sound of explosions is the only piece of audio that sticks in you ears post screening. As far as the performers go, Tintin is a film, which demonstrates that motion capture is a tool for actors to play whoever they want. While Rise of the Apes (hopefully) showed actors that emotions can come through in motion capture, this will show them that they are no longer bound by anything when deciding who they want to play. All the actors are only recognizable by voice and in fairness it is Pegg, Frost and Serkis who do the best of disguising themselves with their voices. Tintin is not a bad film and while the film drags, it is never objectionable. The film despite its flaws has a certain appeal to it however I had a nagging feeling throughout the film that I should be enjoying it more. I wanted to like the film more than I did but ultimately the film never moved me in any way. I admired the craft of the film and liked the various references, three of the actions sequences and the idea of what the film wanted to be. It is directed well, edited well and the sound is tiptop but ultimately the fact that these are the elements I am singling out for praise displays just how unmoved I was by the rest of it. See Tintin in 2D but on the big screen, as such a viewing will enhance its positives. I hope we get the Jackson directed sequel as I believe there is potential with this source material (A source material I intend to become familiar with) however I feel that The Adventures of Tintin: Secret of the Unicorn is well constructed and good intentioned yet it lacks what makes the films it references great and memorable, a gripping story and involving characters. An inconsequential story, a sluggish pace and cold characters means that Tintin is a surprisingly flat Spielberg offering. Disagree with this review? Give us your opinion on The Adventures of Tintin: Secret of the Unicorn in the Your Say section. I've read your "Tintin" review, and while I agree with you about the lack of depth of the characters (especially Tintin), the film totally engrossed me For how predictable the story can be (and I've already read the comics ! and watched the TV series ! ), I never felt it dull or boring. I was immersed in the film's world, full of lavish landscapes. In this regard, I find the film superior to Robert Zemeckis' "Beowulf" and "Polar Express" who, even if they were made a few years ago, failed to truly humanize their characters. (I've not seen "Scrooge", nor "Mars needs Moms"). With this stronger artistic direction, the film also wonderfully displays Spielberg's inventive direction. The Maroccan chase is a tour-de-force ! I think I stopped breathing for 5 minutes, the length of this incredible, mind-boggling tracking shot ! For this sequence only, I would be ready to go back to the theatre.The flashback with the pirates is also an exquisite moment. I think it really shows how far you can go with this technology: characters who look like humans, but who live extraordinary adventures, where literally EVERYTHING is possible.Andy Serkis does a great job as the Haddock Captain ! This man is a real skillful actor. As for the 3D, I strongly suggest you go and see the film with the glasses on ! I enjoyed several films on 3D but I usually tend to forget I put the glasses. A few times only (Up, Avatar, How to train your dragon,..), some scenes reminded me I was watching a 3D projection, but in a good way: the technique allowed me to see farther than I had before. I think this is the case again with "Tintin". In one scene, I felt something flying towards me, while on several occasions, the landscapes were just too beautiful to be real (which was the case actually :) It's an incredible feeling, something you can only experience in a theater. To be fair, I should stress the fact that I did not pay any fee for the 3D glasses, given that I brought mine. To conclude, I've lived one of my most amazing moments of 2011 cinema. I always found Tintin rather sympathetic but he is a dull character, with no background, and no real motives except the need for adventure. Tintin comes from a time (1929 !) where kids were not really used to travel around the world. With his adventures, he offered them escapism and, little by little, invited his audience to places they could only dream of (South America, strange islands, the Moon ! 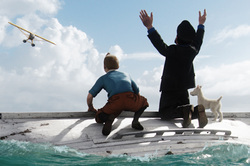 ).Tintin IS escapism and I think Spielberg offered him his biggest and best playground yet.